Warp3D Nova is a modern shader based 3D graphics API (Application Programmers Interface) and driver system for modern GPUs (Graphics Processing Units). It's designed to provide efficient access to modern graphics hardware. All rendering is performed using programmable shaders, so there is no fixed pipeline or predefined shading model. The application/game programmer is free to use whatever shading model he/she wishes, or even whether to use 2D or 3D geometry. Current public version of Warp3D Nova is v1.34 released in the Enhancer Software package for AmigaOS. Simply run the Enhancer Software installer. This will install Warp3D Nova, and included drivers. If you have the AmigaOS 4.x+ SDK installed, then it will also install the developer files into the SDK for developing applications/games that use Warp3D Nova. 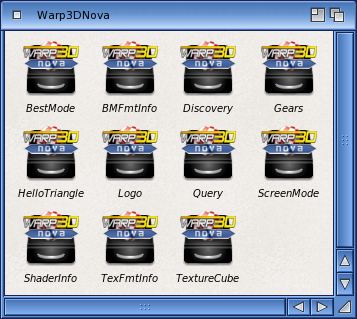 Once installed, you can run the examples (in the examples drawer of the Warp3D Nova package) and any applications/games that use Warp3D Nova. Of course, this assumes that your system meets the requirements listed above. The documentation and files necessary to develop a Warp3D Nova driver are in the Driver Development Kit (DDK), which is a separate package to Warp3D Nova itself. Copyright (C) 2015-2017 by A-EON Technology Limited, all rights reserved. WARNING: Unauthorised copying and distribution is prohibited by law. This page was last modified on 14 January 2017, at 15:15. This page has been accessed 33,725 times.